These first batch of comics were actually made a while ago. I thought, “Hey. Why make entirely new material when I can recycle old material.” I’m also the kind of person who complains when he has to lift things. Just noticed this is, in fact, black and white with dots. The whole blue monochrome thing is clearly more evidence of mental overlap with “pictures for sad children”. don’t worry about it. Ghosts are totally going the next stupid pop culture undead thing. Just wait until something with zombies becomes popular with too many people. Then strike while the iron is hot. Then stop listening to me. Love. Love. <3 Love. 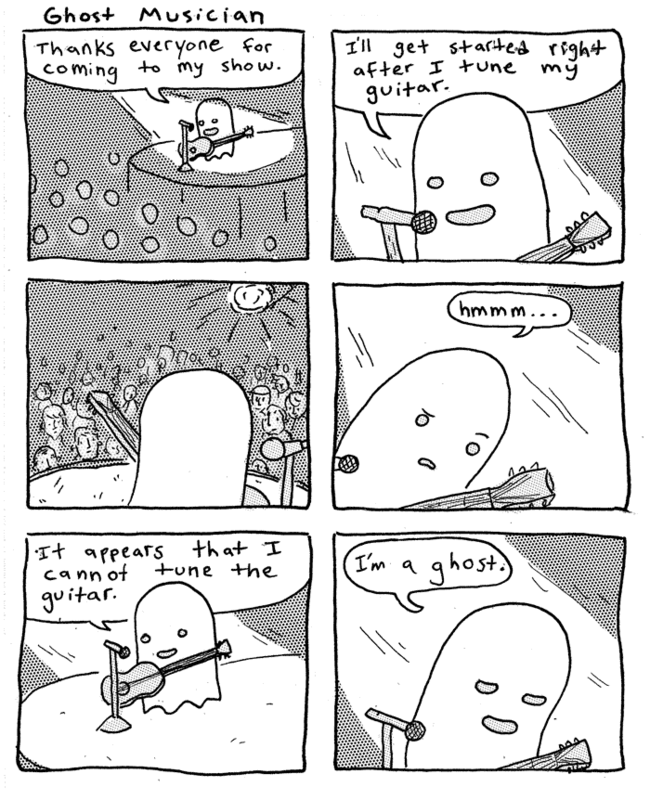 The voice that the ghost has in my mind (especially the last 2 panels) are too perfect.